"Kunzite" redirects here. For the Sailor Moon character, see Dark Kingdom § Kunzite. Spodumene is a pyroxene mineral consisting of lithium aluminium inosilicate, LiAl(SiO3)2, and is a source of lithium. 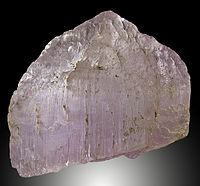 It occurs as colorless to yellowish, purplish, or lilac kunzite (see below), yellowish-green or emerald-green hiddenite, prismatic crystals, often of great size. Single crystals of 14.3 m (47 ft) in size are reported from the Black Hills of South Dakota, United States. The normal low-temperature form α-spodumene is in the monoclinic system whereas the high-temperature β-spodumene crystallizes in the tetragonal system. The normal α-spodumene converts to β-spodumene at temperatures above 900 °C. Crystals are typically heavily striated parallel to the principal axis. Crystal faces are often etched and pitted with triangular markings. Spodumene was first described in 1800 for an occurrence in the type locality in Utö, Södermanland, Sweden. It was discovered by Brazilian naturalist Jose Bonifacio de Andrada e Silva. The name is derived from the Greek spodumenos (σποδυμενος), meaning "burnt to ashes," owing to the opaque, ash-grey appearance of material refined for use in industry. Spodumene occurs in lithium-rich granite pegmatites and aplites. Associated minerals include: quartz, albite, petalite, eucryptite, lepidolite and beryl. Transparent material has long been used as a gemstone with varieties kunzite and hiddenite noted for their strong pleochroism. Source localities include Afghanistan, Australia, Brazil, Madagascar, Pakistan, Québec in Canada and North Carolina, California in the US. World production of lithium via spodumene is around 80,000 metric tonnes per annum, primarily from the Greenbushes pegmatite of Western Australia and from some Chinese and Chilean sources. The Talison mine in Greenbushes, Western Australia is reported to be the largest and to have the highest grade of ore at 2.4% Li2O (2012 figures). Terence Bell thinks that spodumene will become a less important source of lithium due to the emergence of alkaline brine lake sources in Chile, China and Argentina, which produce lithium chloride directly. Lithium chloride is converted to lithium carbonate and lithium hydroxide by reaction with sodium carbonate and calcium hydroxide respectively. However, pegmatite-based projects benefit from being quicker to move into production than brines, which can take 18 months to 3 years, depending on evaporation rates. With pegmatites, once a mill is built, the production of lithium carbonate takes only a matter of days. Another key advantage that spodumene has over its more popular brine rivals is the purity of the lithium carbonate it can produce. While all product used by the battery industry has to be at least 99.5% lithium carbonate, the makeup of the remaining 0.5% is important; higher amounts of iron, magnesium or other deleterious materials makes brine a less attractive product. Hiddenite is a pale emerald green gem variety first reported from Alexander County, North Carolina, US. It was named in honor of William Earl Hidden (16 February 1853 - 12 June 1918), mining engineer, mineral collector, and mineral dealer. Kunzite is a pink to lilac colored gemstone, a variety of spodumene with the color coming from minor to trace amounts of manganese. Some (but not all) kunzite used for gemstones has been heated to enhance its color. It is also frequently irradiated to enhance the color. Kunzite was discovered in 1902, and was named after George Frederick Kunz, Tiffany & Co's chief jeweler at the time, and a noted mineralogist. It has been found in Brazil, US, Canada, CIS, Mexico, Sweden, Western Australia, Afghanistan and Pakistan. Triphane is a yellow colored variety of Spodumene. ^ "Greenbushes Lithium Mine". Golden Dragon Capital. Retrieved 18 January 2019. Kunz, George Frederick (1892). Gems and Precious Stones of North America. New York: The Scientific Publishing Company. Webster, R. (2000). Gems: Their Sources, Descriptions and Identification (5th ed. ), pp. 186–190. Great Britain: Butterworth-Heinemann. The key players in Quebec lithium, “Daily News”, The Northern Miner. August 11, 2010. 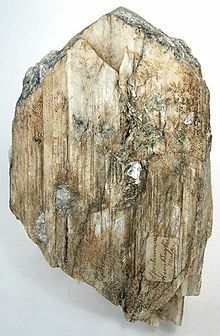 Wikimedia Commons has media related to Spodumene. "Kunzite" . Encyclopædia Britannica (11th ed.). 1911. Rudler, Frederick William (1911). "Spodumene" . Encyclopædia Britannica (11th ed.). "Spodumene" . New International Encyclopedia. 1905.